Create an amazing fantasy dragon using a range of colourful and decorative materials. Ideal for studies of China (Year of the Dragon) or historical themes such as those involving knights, castles and other medieval themes. 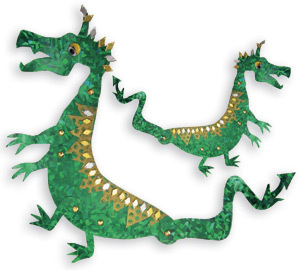 These mythical creatures can be as decorative as desired or used as a simple collage activity like this one. Cover the head, body and tail with Metallic Prism Paper or other metallic paper. Cut strips of Metallic Mesh Tissue and scallop or zig-zag one long edge on each strip. Glue the paper strips in layers up the body of the Cardboard Dragon. Add Diamonds for extra decoration on the body. Decorate the head of the dragon with Sequins and a Joggle Eye. Use the Paper Fasteners to secure the legs, head and tail to the body of the decorated dragon.